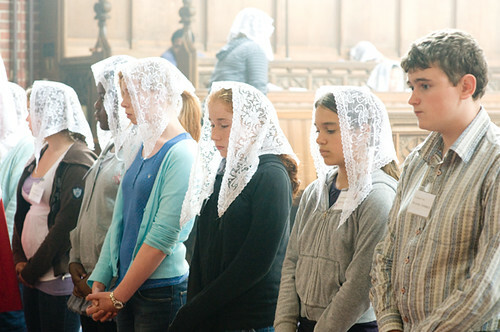 Students waiting to receive communion at the St Catherine's Trust Summer School 2009. The photo was taken by Emma Duggan. Voters can say whether it should be voluntary or obligatory; unsurprisingly perhaps the voluntary option is the most popular. On reflection however this doesn't really make sense. First, it is already voluntary. If you want to revive it you have to change its legal status. It was obligatory from Apostolic times until the 1983 Code of Canon Law, and it is an anomaly, historically speaking, that this obligation was removed. Secondly, things which are 'obligatory' in church law are not exactly enforced, or even consistently promulgated. How many people know about the obligation of Friday penance? How many receive communion only in a state of grace? To say it should be obligatory is not to suggest women not covering their heads should be whipped out of church. Thirdly, and this is the crux of it, right now women who choose to cover their heads are actively persecuted by the usual liberal fascists. They get funny looks; priests tell them they are drawing attention to themselves; they are accused of spiritual pride and all the rest of it. One young woman I know started going to the Traditional Mass because only there could she 'get away with' wearing a mantilla. You get the same thing when people want to receive communion kneeling, or when priests prefer not to concelebrate. The only way to protect good practice against social pressure of this kind is to make it obligatory. And if it is a pious practice, what could be the objection? Even that is not enough, of course - people have become so used to liturgical abuses they criticize people who want to follow the law. But it would be a step in the right direction. Finally, the main reason give against making it obligatory is actually a reason in favour. The reason is this: many women don't feel comfortable wearing a mantilla. Why not? The discomfort comes from their not being used to it, and to it looking like a big 'statement'. If it were an obligation, it wouldn't be such a statement, and they would get used to it. And so this pious practice would become 'doable' once more for the great majority. According to Mrs Bogle, Joe, you are a fantasist! Well there are always American extremists who can make sensible things look silly and she's caught up with some of those. I'm not sure she'd put me in the same camp though she might. But what's this about 'our theology of human dignity' being against 'veiling'? Is that a theology shared with St Paul, or is he old hat (boom boom)? Yes, that's the post but if you challenge Mrs B she does not appear to include it in her combox. You seem to be confusing a big issue in your post. While the Church Law for women to cover their heads at sacred services has been abrogated since 1983, the divine law for a woman to cover her head at prayer and prophesy as found in Scripture and tradition still binds... All that is contained in the word of God as found in Scripture and tradition is binding upon our belief by divine and Catholic faith (paraphrased from the First Vatican Council), which makes it eternally binding upon us. This means women must both choose it voluntarily as well as see that it is an obligatory/mandatory manifestation of internal belief (i.e., assent). There is also another issue at root here...and that is the natural obligation for a woman to cover her hair in public and some semi-public situations (a woman's beauty is not for herself, but for her family and should therefore be kept for her family). While most mantillas fit the bill for a woman's head covering, they fail miserably as a "natural" hair covering. Contemporary social integration doesn't shine kindly on a woman keeping her beauty for her family alone and so saying that a woman must not only cover her head at prayer (following divine law), but also cover her hair in public (following natural law) will come across as the rantings of a mad woman. Well, it's a perfect example of what the truth does, though, and that is divide people. As Jesus Christ himself said, "Think ye, that I am come to give peace on earth? I tell you, no; but separation." Where would one find evidence of this natural law principle? As for the divine law one: it isn't divine law (given by God), simply an apostolic tradition. It can be abrogated by the Church. Evidence that it is natural law for a woman to keep her beauty for her family generally and specifically to cover her hair in public is found in the fact that due to the original sin, men and women experience concupiscence (in general) when seeing the exposed parts of women. That doesn't stop merely at the hair of a woman, but also her figure, her chest, her cleavage, her midriff, etc. It's part of what governs human modesty. And on your attempt at refuting "the divine law one," I do not personally see how you can pose yourself against the rule that the First Vatican Council gives us in Ch. 3 (On Faith), #8.